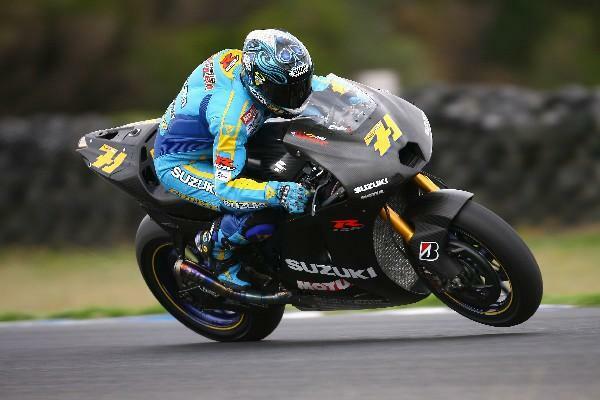 Suzuki suffered its worst day of the new 800cc MotoGP today as John Hopkins and Chris Vermeulen were comprehensively outpaced on the opening day of testing in Phillip Island. Both were consistently a second off the pace of the fastest riders with Hopkins only managing a best of 1.31.86. That was 1.2s behind surprise pace-setter Alex Barros, while Aussie Vermeulen, back on the track where he scored his first premier class podium just five months ago, could only muster a best of 1.32.00. Phillip Island was easily Suzuki’s worst track in 2006 and old problems with the 990cc GSV-R surfaced again, with rear tyre durability the biggest issue for both riders. Clearly it is a bike issue as Bridgestone occupied the top three positions on the time sheets today, with Barros just 0.1s in front of Italian duo Loris Capirossi and Marco Melandri. As feared by Hopkins and Vermeulen, despite their brilliant testing displays in Valencia, Sepang and Jerez, the problem centres round a too aggressive power delivery through Phillip Island’s fast sections. Hopkins said: “We kind of expected some issues down here because we’ve had them before.